Dame Fortune smiled on this weeks Sunrise Birding Trip again (forthcoming trips here). My plan was to have a northwesterly wind and try and pick up some migrants overhead including some much sought after Cave Swallows. With Saturday being pretty much a washout and westerly winds predicted Sunday I decided to postpone the walk and boy did that ever pay off. We started Sunday at Compo Beach in Westport and quickly started to rack up a few birds although I was somewhat disappointed to find that the usual bunting, lark, longspur stop was devoid of birds. Out on the sound I had one interesting looking loon which was disappointingly just too far away to make any definitive ID on although with the wind blowing up a storm it would have almost have to have been sat on the beach to have felt comfortable to call it anything other than a regular Common Loon. As we scanned the sound I turned to check on a couple of members of the group who were arriving late and quickly spotted some pale throated swallows screaming over the lot towards us. As they dashed past I spotted the pale rumps and there we had our first Cave Swallows of the day, they were not to be the last. As we scanned the bay we started to pick up a rather large flock of swallows out over the water and through the bins and later with the scope I managed to ascertain this was another group of Cave Swallows. A nice collection of Caves but the looks for most of the group were far from definitive. In the hope that the Swallows might be a little more co-operative there we hot-footed it over to Sherwood Island to try and get some better views of our quarry, again we were getting to see good numbers of swallows but they always seemed to be in the part of the park that we were not. After much amusing to-ing and fro-ing up and down east beach, the ‘goddess of birding’ eventually relented and we finally had great views of a number of swallows as they hunted the dunes and the east beach parking lot. There was quite a nice accompanying cast of birds at Sherwood to keep us entertained while we tried to pin down the swallows. 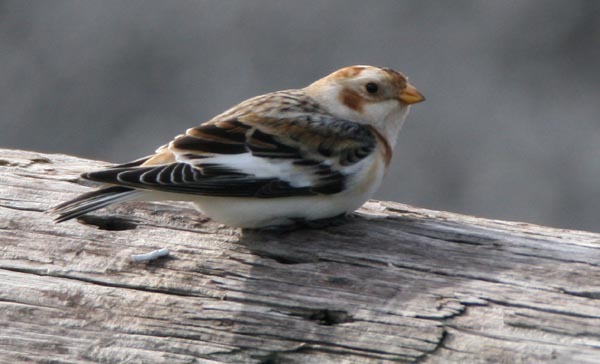 Highlights included a nice male Kestrel (perched in the east beach parking lot which allowed for amazing scoped views), 3 Black Vultures soaring over the park and then meandering west in great light, 50+ Snow Buntings – including a small flock that posed perfectly for pictures (see documentary proof from Walt Duncan above). All this time there were plenty of birds streaming overhead making their way south and westward including a half dozen American Pipits, an assortment of blackbirds, Cedar Waxwings, and some very large flocks of uncooperative finches which steadfastly refused to call. Highlight of this westerly flow of passerines was the one western vagrant we found on the deck today in the shape of a probable immature “western” subspecies of White-crowned Sparrow. The “western” subspecies of White-crowned Sparrow have bills that range from bright yellow in nuttalli to what I have often heard termed ‘candy corn’ colored in gambelii. This bird seemed to have a fairly yellow/orange bill, and also was much grayer looking than your average eastern White-crowned to my eye. It also seemed a little slighter and smaller than your average White-crowned but it was hard to judges this with little to directly compare it to. Anyway if it is what I think it is it’s proof that there are probably more western vagrants to be uncovered out there somewhere in Connecticut. Interestingly I found and later one of my walk participants photographed the first documented record of Gambel’s White-crowned Sparrow here in Connecticut at Allen’s Meadows last year (local paper article here). Common Loon, Red-throated Loon, Northern Gannet, Double-Crested Cormorant, Great Cormorant, Great Blue Heron, Mute Swan, Canada Goose, Brant, American Black Duck, Mallard, Gadwall, Bufflehead, Turkey Vulture, Black Vulture, Coopers Hawk, Northern Harrier, Osprey, Red-tailed Hawk, American Kestrel, Killdeer, Greater Yellowlegs, Ring-billed Gull, Herring Gull, Great Black-backed Gull, Rock Pigeon, Mourning Dove, Monk Parakeet, Belted Kingfisher, Northern Flicker, Downy Woodpecker, Blue Jay, Fish Crow, American Crow, Cave Swallow (30+), Black-capped Chickadee, Tufted Titmouse, White-breasted Nuthatch, Carolina Wren, Golden-crowned Kinglet, Eastern Bluebird, American Robin, Northern Mockingbird, American Pipit, Cedar Waxwing, European Starling, Yellow-rumped Warbler, Northern Cardinal, Field Sparrow, Song Sparrow, Swamp Sparrow, White-crowned Sparrow (plus possible “western” subspecies), White-throated Sparrow, Dark-eyed Junco, Snow Bunting, Red-winged Blackbird, Brown-headed Cowbird, Common Grackle, House Sparrow, American Goldfinch, House Finch. There are two distinct populations of Cave Swallows in the US, one in Florida which is of a Caribbean subspecies and one from the Southwest – range map here. It has been suggested that these may in fact even be two separate species of birds and they are at least readily identifiable in the field and well illustrated in Sibleys and Nat Geo. About 20 years ago it was discovered that in late fall that these Cave Swallows were showing up on the east coast in Cape May. It seems incongruous when you look at the map to imagine that these birds would show up in Connecticut but as the pattern of their dispersal from breeding grounds up into the great lakes region and then west and down the east coast became better understood more and more seem to be regularly found by birders actively targeting this species in early through mid-November. There have been a couple of great posts about the history of Cave Swallows and their patterns of vagrancy on the Ohio listserve – here and here. The blog looks great so far. It’s a nice experience to go on the walks, find “life” birds, then come home and see photos of these same individual birds on the blog.